It’s hard to keep track of what’s a superfood these days and what’s just like, a regular-powered food, but heck, plenty of people love gobbling up whatever the newest, trendiest thing is. Which is why in the future you might be hearing a lot about a new contender in the wonder food category, camel milk. 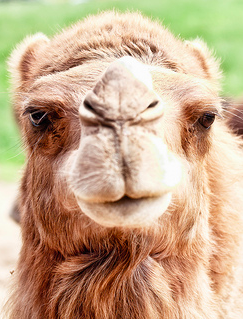 Yes, those humped, gangly animals you probably loved taking a ride on at the zoo when you were a kid could be part of the next superfood fad, reports The Citizen-Times, as one farmer is hoping to build up a business selling camel milk as a health drink. On a farm near Asheville there are 23 camels, including the humped dromedaries as well as the double-humped Bactrians, along with a herd of buffalo. The owner of the farm says he wants to grow his camel milk business, modeled on the fact that it’s been a staple food in the Mideast for a long time. And he could sell the stuff at $18 a pint as a nutrition and dietary supplement. According to some scientific studies, camel milk’s benefits include higher levels of potassium,magnesium, iron, copper, manganese, sodium and zinc than in cow’s milk, lower cholesterol levels than cow or goat milk, and is three times higher in vitamin C and 10 times higher in iron compared to cow’s milk. It also has more fat and protein than cow’s milk, and it’s higher in unsaturated fatty acids and B vitamins. I know what you’re thinking, because I’m thinking it too — what the heck does camel milk taste like? “The milk is tasty. The dromedaries’ milk has a slightly salted taste and creamier. The Bactrians’ is less salty,” he explains. He should know — he and his family drink it four times a day for better health. Camels are milked by hand, and you don’t need to even sit down to get the job done, since camels are a lot taller than say, a cow or a goat. Right now the farm is still working on figuring out pasteurization methods as required by federal law, if the milk wants to travel across state lines. And this farm isn’t the only one — there are several farms with collections of breeding camels that are working on milking programs, in states like Michigan, Missouri, Oklahoma, Pennsylvania, Indiana, North Carolina and Ohio. A slew of other states are also scheduled to open new programs as well.